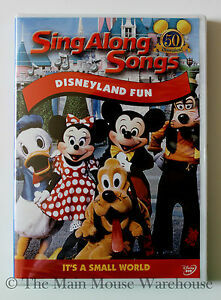 Details about Disneyland Fun Sing Along Songs Disney Music Karaoke DVD It's A Small World Etc. Disneyland Fun Sing Along Songs Disney Music Karaoke DVD It's A Small World Etc. Great product for collectors. Fast shipping. Easy transaction. Thank you. Fantastic DVD. We play it all day long when my grandson visits. I purchased this item to play for my 2 year old grandson when I babysit him two days a week. We live in Anaheim and have annual passes so I take my grandson to Disneyland very often. We start the DVD early in the morning and we sing the songs together all day long. When the last song begins he starts telling me "AGAIN Grandma!" He loves watching the rides and tells me "I'm bigger now" when he sees rides he has never ridden. I enjoy seeing the changes that have taken place since the video was made. The buckets are no longer there that went through the Matterhorn and the People Mover is long gone. I was one of the local grads who attended the first Grad Night at Disnelyand. I should be an honorary Mousekateer. I took dance lessons as a child right after Bobby Burgesss -- one of the official Mousekateers and a featured dancer on the Lawrence Welk show. I only wish the DVD was longer or had a volume 2 as it is so much fun to watch and listen to. I actually learned the words to Small World. We love this DVD and would recommend it to everyone from 2 - 100 years old. It makes you want to watch, to sing and to dance. The dvd is in great condition and my 1 year old, who is obsessed with Mickey and Minnie, loves it! It will be another year before i take her back to Disneyland. Everytime i play it for her, no matter where she is in the house, she'll come running. Great gift. I used to watch this as a child and loved it. Watching it makes me nostalgic in a happy way for Disneyland and childhood. I bought it so that I can watch it with my four year old niece and she can experience the magic too. 10/10 would recommend for Disneyland lovers and 90s kids alike.